My objective for creating this page is to give an appreciation for this film that many of you may not know about, or have forgotten. If you are a Zoids collector, you need this DVD! I have been wanting to do this page for a long time, but I didn't know how to go about it. Hopefully I gave this film the credit it deserves. 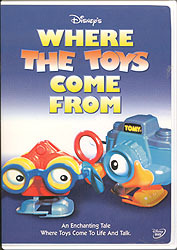 This is not a program about toy robots. Although it has appearances of many toys, and some of them are robots. It's a film about how toys are made. A large part of the show is made at the Tomy toy company in Japan, which has been responsible for many of the toy robots in my collection as well as my Zoids. It is a time capsule from 1984 that has rare footage of mostly non-robot toys. However, it has the ONLY vintage Zoids footage that I know of, and near the year of their creation! I saw this on the Disney Channel in 1984, and discovered it on DVD. This film was written for children, the young at heart, and the few of us that really appreciate all levels of production that are needed to finally place a toy on the shelf at a store. It is very educational and entertaining. Why am I so excited about the Tomy company? 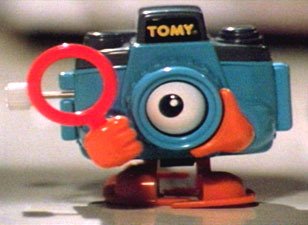 Tomy is responsible for many robots in the eighties that are sought after today. My Tomy robots include: Acrobots, Chatbot, Hootbot, Motor Blocks Dinosaurs, Omnibot 2000, Spotbot, Stoomdorm, 2 little wind up robots, and my entire Zoid collection. What I have is a very small sample of what Tomy has done for the toy robot market. Tomy has personally brought a lot of happiness to my life. 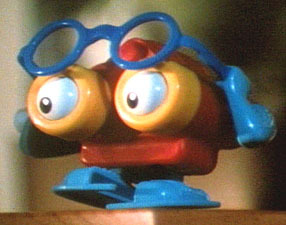 Peepers and Zoom start to question their existence and where they came from. Their journey starts in a little girls room full of toys, and eventually takes them to the drawing board where they were first conceived. 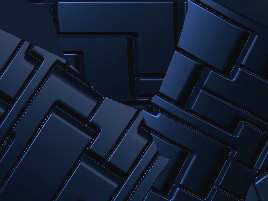 We then see the process of mold making, assembling and painting where it ends. It's an enchanting story created by Ted Thomas, son of the Disney animator Frank Thomas.